SCVHistory.com LW7001 | Valencia | County Civic Center. 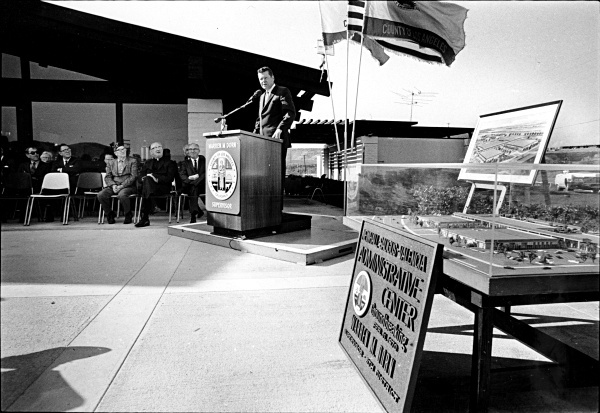 Los Angeles County 5th District Supervisor Warren M. Dorn presides at the Feb. 11, 1970, groundbreaking of the County Civic Center (then called the Newhall-Saugus-Valencia Administrative Center), located at the northwest corner of Valencia Boulevard and Magic Mountain Parkway. The administrative center was designed to include all major governmental services in one place: the Sheriff's station (which moved from San Fernando Road in 1972), the Valencia Regional Public Library, the Newhall Municipal Court (later Santa Clarita Superior Court), and other county offices such as the tax assessor and the probation department.